Air pollution is highest in the world's poor cities, according to a new report, raising concerns about the link between the two. According to the latest urban air quality database from the World Health Organization (WHO), 98 percent of poor and middle income cities with more than 100,000 inhabitants don't meet the organization's air quality guidelines -- and the levels are rising. "It is very critical because air pollution has short-term, but also long-term effects," Dr. Sophie Gumy, who worked on the WHO database, told ABC News. "It increases the risk of lung cancer, respiratory disease, strokes and heart diseases." 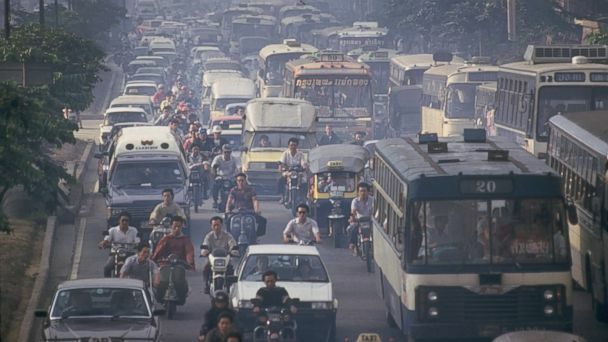 Every year, seven million people die worldwide because of air pollution, according to the organization. Power generation, transportation and industry are some of the biggest sources of air pollution. Fuel burning is also a common cause of air pollution, especially in poor places where residents often use coal and trash to cook because it's cheap or even free. "The problem with many poor cities is that they have all these sources at the same time," Gumy said. "Industries are usually located outside of cities in high-income countries so fewer people are impacted." She said that urban areas in Southeast Asia and the Eastern Mediterranean regions are some of the most polluted ones. It is common in these cities that the pollution is 10 times higher than WHO's recommended level. Overall, more than 80 percent of people who live in urban areas are exposed to air quality levels that exceed guidelines set by WHO. In rich countries, 56 percent of cities have a level of air pollution that exceeds WHO guidelines. The WHO database covers 3,000 cities in 103 countries. Gumy said that even though the findings aren't uplifting, the fact that more cities are measuring air pollution levels is positive. "Monitoring is the first step," she said, adding that there is a need for fuel regulation and more environmental transportation. "It is important to invest more in energy-saving transportation to reduce air pollution. It also has an impact on road safety and the well-being of people."